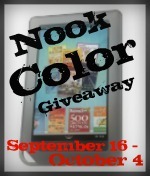 Celebrate your love of reading with a Nook Color Giveaway! If you’re anything like me, then you probably love reading. Are those books piling up around the house? You should probably think about getting a Nook Color…especially since you have the chance to win one for free! I’ve joined up with the awesome bloggers listed below to bring you this amazing opportunity to win a NOOK COLOR! Do you want to win this awesome prize? It’s so easy! Just fill out the Rafflecopter form below! You MUST complete the mandatory entry of liking all the blogs facebook pages! Once that is done, there are additional entry options! REMEMBER, the more entries you do, the better your chances of winning! GIVEAWAY ENDS ON OCTOBER 4TH AT 11:59 PM! « My Time-Tested Tips For Throwing a Great Party!